Thank you for joining us to support families going through dark times. There are many ways in which you can support the KMMT. To date KMMT runners in the London Marathon have raised over £250,000 and brought our Trust to the attention of a large number of supporters who would not otherwise know about our work. Please contact us if you would like to run as a member of the KMMT’s Golden Bond in a future London Marathon. 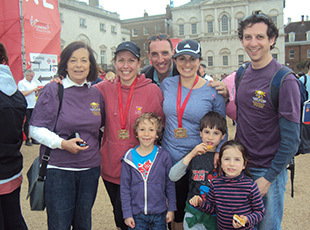 Marathon runners Anouska Plaut and Jessica Rosenfield with their support team and KMMT Chair Sylvia Morris. The KMMT has a Golden Bond for this unique event. 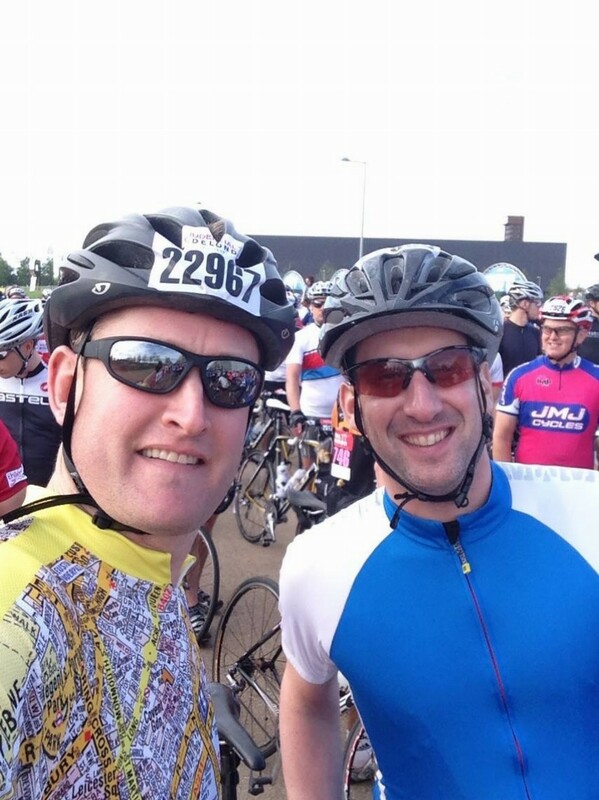 If you can cycle 100 miles, want to boast that you have completed the London Olympic route 2012 and raise valuable funds for the Trust, please contact Sylvia (info@kmmt.org.uk). An exclusive opportunity to cycle 100 miles of the 2012 Olympics cycling road route. Follow in the tyre tracks of Bradley Wiggins and raise vital funds for our work. 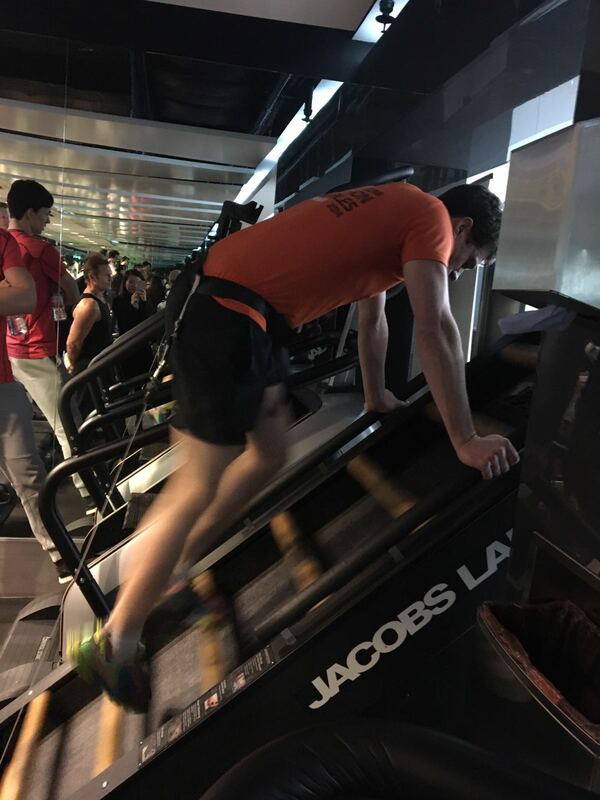 A member of the Barclays Team Macro Everest Challenge. The event was in support of their colleague, and Karen’s Woodridge Primary School friend, Tarun Mather. We are very grateful to Tarun for thinking of the Karen Morris Memorial Trust when facing his own Everest challenge. As he said, he is currently undergoing treatment for testicular cancer which tests his determination and resilience to the limit. Staff raised over £34,000 which will be matched by Barclays and with gift aid will bring the total to over £70,000, making it the largest fundraising event in the KMMT’s history! 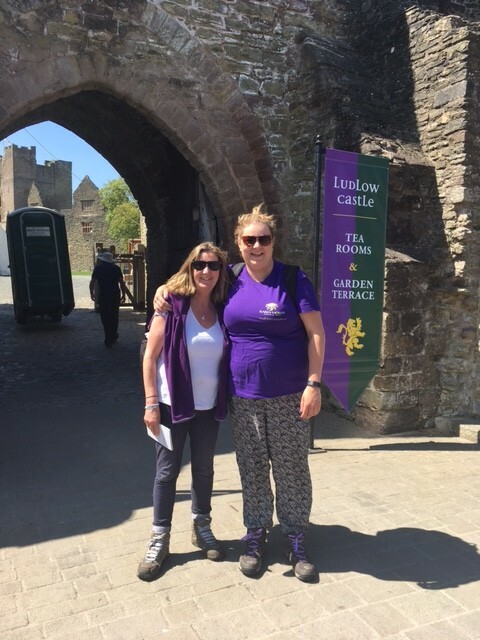 Very warm congratulations to Jess Ryan who marked her birthday and 10 years since her bone marrow transplant by walking the Mortimer Trail in gratitude for her mum, Jane, staying at Karen’s Home from Home at Hammersmith Hospital while Jess was undergoing treatment. There are now a wide variety of events being organised throughout the world and for every level of fitness. Or why not organise your own challenge: we continue to be overwhelmed by our supporters’ initiatives such as the Mudders Challenge, climbing Pen Y Fan (the highest mountain peak in South Wales), 5-a-side football matches and many more. To dicuss further and get your challenge underway simply drop us an email. 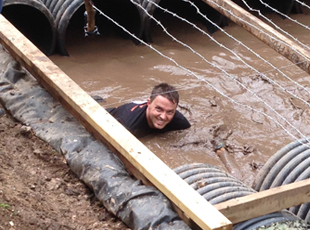 Matt Beckett in the midst of the Tough Mudders Challenge. 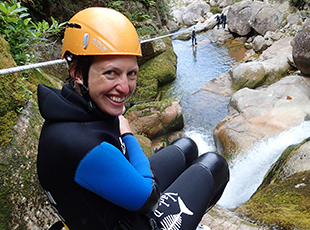 Alison Mudd did a sponsored canyon ride in Abel Tasman National Park, New Zealand in gratitude for staying at Karen's Home from Home at Addenbrooke's Hospital during her late husband's treatment. Many of our supporters mark the important milestones of their friends and family with this special gift, which we recognise with a celebratory certificate. If you are celebrating a major milestone and you don't want any gifts, ask your guests to donate to the KMMT. At £30 per night’s stay in one of Karen's Homes, you and your guests can make a real difference. Request a collecting box for your desk, shop counter, in your hallway and encourage your staff, visitors, family to lighten their pockets. Recommend the KMMT as the ‘Charity of the Year’ for your company/school/community. Remember the KMMT in your will. As a registered charity the KMMT is exempt from inheritance tax and can, therefore, receive the full value of your bequest. Spare stock? Unwanted gifts? We welcome donations for raffle and lucky dip prizes. Sponsor a KMMT event or newsletter. You can double, sometimes even triple your gift to the KMMT if you work for one of more than 1000 companies with matching gift programmes. We regularly collect at outdoor events and shopping centres. The more collectors we have the more money raised! Just £5 a month over one year will fund two nights' accommodation. Payroll giving/matching gifts: many companies have a matching gift programme, ie they will match any charitable donation made by their employees. Find out if your employer has one – or ask them to start one. If you are an employer, why not start one yourself? Completing a gift aid form if you are a UK tax payer so the KMMT can claim from the government. Those who complete a self-assessment tax return can now nominate a charity to receive all or part of any repayment due which will be paid directly to the charity’s bank account and gift aid paid without the charity making a claim. Please quote our unique code QAG77YG. Easyfundraising is a great way to raise money for charity and you don’t pay anything extra. For example, to buy a pair of shoes from John Lewis, instead of going to johnlewis.com directly, you first go to easyfundraising.org.uk. Click there through to John Lewis to make your purchase (this tells John Lewis you came from easyfundraising). The price of the shoes is exactly the same. After you buy your shoes, John Lewis will give you a cash reward that you can turn into a donation for your good cause. Easyfundraising collects this and sends it on at no extra cost. Thank you for your interest in our work. We look forward to hearing from you.